Serve breakfast with a sunny side of kitty love. "The fog comes on little cat feet," wrote poet Carl Sandburg. And now eggs come in a little cat face. 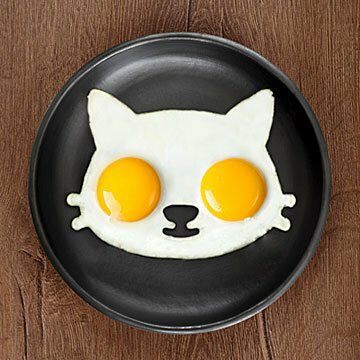 Set this silicone cat mold in a hot frying pan, pour the eggs into the "eyes", and instantly be the most popular person at breakfast, especially among the kiddo set. Bonus: This kitty won't bother you in the middle of the night—it will only show up after you're already awake. Made in China. Pair your Cat Egg Mold with our Dog Egg Mold. Very cute. It'll never look like the picture here, but if you move the pan to get the egg around (being careful it doesn't leak out of the mold) it distributes pretty evenly. Overall the results are adorable. This was bought for a friend not myself. I've never used it. I'm sorry I can't tell you anything about. My friend did tell me he likes it and planned to use it. He didn't say anything else about it. Easy to use- not easy to get well cooked eggs without flipping. But a very forgiving audience who is always ready to eat eggs when cooked using this contraption. I bought the cat and dog egg molds for my children to use for my grandchildren. They have been a success particularly for the fussy eaters.